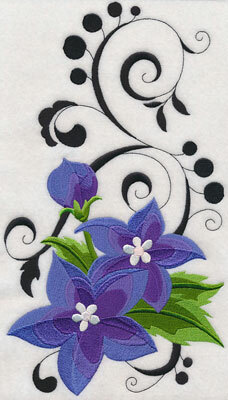 Jumpstart your creativity with flourishing, fanciful embroidery designs! 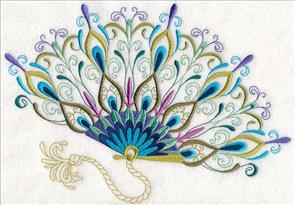 Full of swirls and twirls, filigree, and more, they're gorgeous on pillows, totes, and wall hangings. These designs are perfect for inspiring your creative muse! 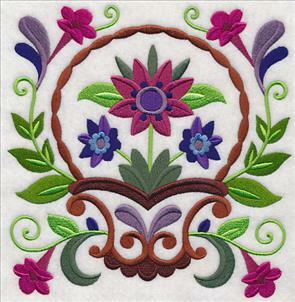 Add these whimsical designs to your next project! 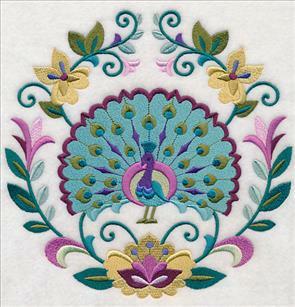 Ranging from themes including stunning peacocks, crafty notions, symmetrical squares, and more, they're terrific embroidered additions to pillows, totes, and wall hangings. 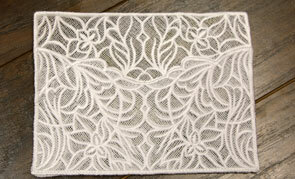 Plus, new lace envelopes and lace sprays, too! 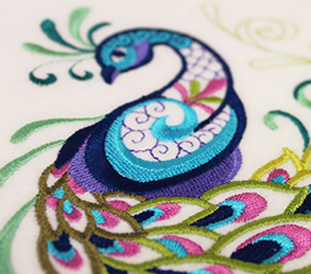 Beautiful color choices and intricate stitches give this peacock a stunning style. Peacocks are magnificent creatures, and their feathers are equally impressive. Stitch the majestic bird (and a coordinating fan!) 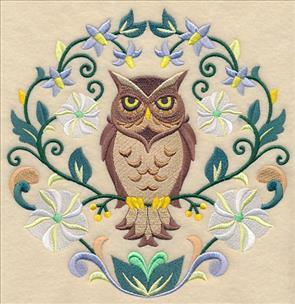 on a pillow, tote, or wall hanging. 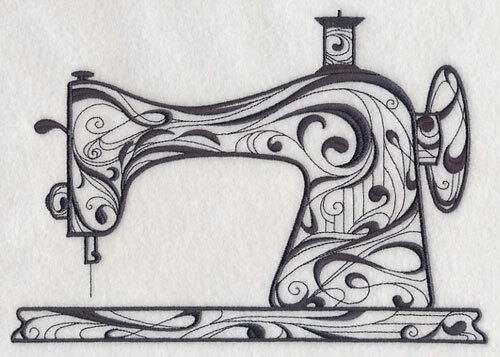 9.73" x 6.88" and 7.79" x 5.51"
6.78" x 7.79" and 5.85" x 6.72"
4.85" x 5.58" and 3.35" x 3.86"
Sewing rooms, crafty nooks, and even apparel will get an oh-sew-stylish upgrade thanks to this sewing machine design. 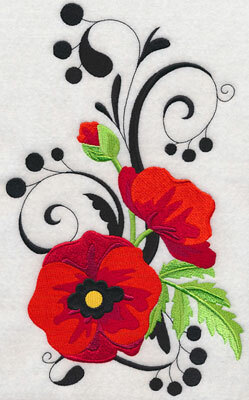 The quick-stitching motif is terrific for embroidering on pillows, sewing machine covers, wall hangings, and more. 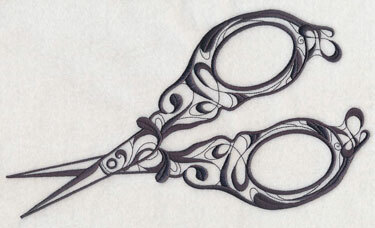 9.82" x 6.86" and 8.39" x 5.86" and 7.81" x 5.45" and 6.87" x 4.79" and 3.87" x 2.70"
A dress form and pair of scissors are stunning additions to stitch alongside the sewing machine design above. 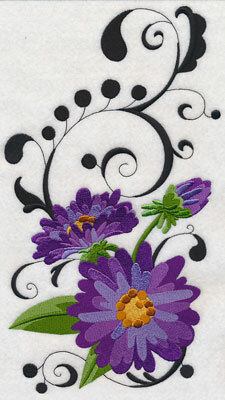 The one-color crafty notions are full of beautiful swirls and flourishes, and are terrific on a wide variety of projects. 4.87" x 11.75" and 3.90" x 9.40"
3.24" x 7.80" and 2.83" x 6.83"
11.76" x 6.75" and 9.41" x 5.41"
7.81" x 4.49" and 6.86" x 3.94"
Let stunning flowers bloom on your next embroidery project. With a big, beautiful blossom and striking black flourishes, these designs are sure to wow on curtains, totes, and wall hangings. 6.90" x 11.18" and 5.80" x 9.40"
6.66" x 11.75" and 5.33" x 9.40"
4.42" x 7.80" and 3.88" x 6.85"
A tote bag is the perfect place to showcase these whimsical flower designs. 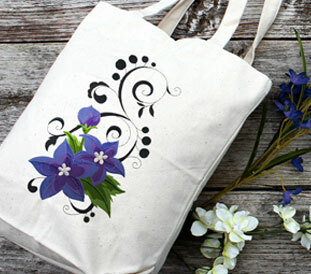 Embroider on a store-bought bag, or make your own! Explore the inspiring tote bag tutorials available in this fun mini-magazine, the Totally Totes Lookbook! 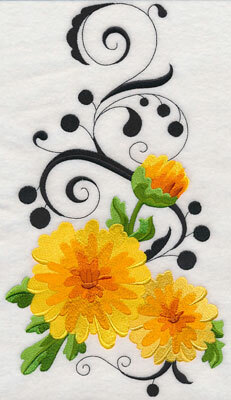 Six different types of flowers are available -- a poppy, balloon flower, zinnia, aster, mum, and cosmos. The perfect way to customize table runners, jacket backs, and more! 6.90" x 11.42" and 5.68" x 9.40"
6.62" x 11.75" and 5.30" x 9.40"
4.40" x 7.80" and 3.86" x 6.85"
Pick your favorite flower and stitch alone, or use all six on a quilt, wall hanging, or set of placemats. 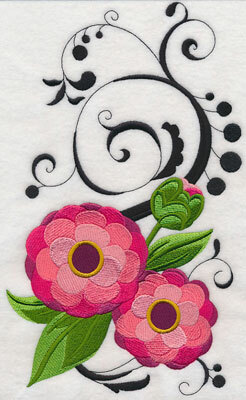 The colorful blossoms and strong lines of the flourishes make an incredible combination. 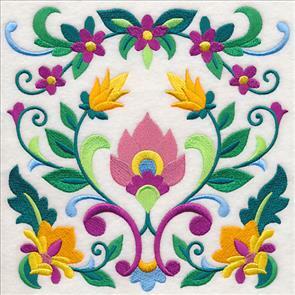 6.90" x 10.91" and 5.86" x 9.26"
6.44" x 11.75" and 5.15" x 9.40"
4.28" x 7.80" and 3.76" x 6.85"
Embroider these gorgeous flowers on your next project! Purchase them individually using the links above, or get them all in a design pack. 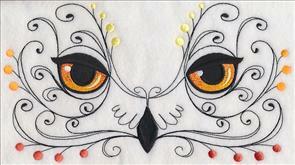 Blankets, T-shirts, pillows, and more get an eye-catching look thanks to these flourishing animal faces. 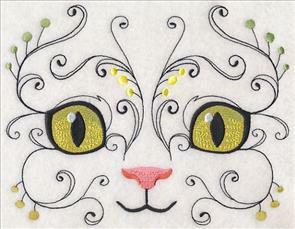 A kitten and an owl bring fun and whimsical style to any embroidery project! 7.80" x 6.09" and 7.08" x 5.50"
9.37" x 5.20" and 7.79" x 4.40"
6.85" x 3.87" and 3.85" x 2.18"
Adorable woodland creatures stun in these bright and colorful designs! 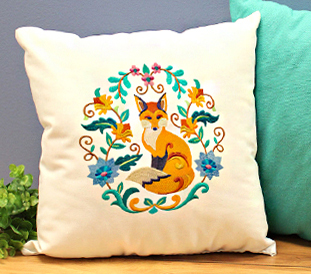 A fox and pair of hummingbirds are brilliant additions to pillows, totes, and more. 7.76" x 7.79" and 6.86" x 6.88"
5.86" x 5.88" and 4.86" x 4.87"
7.79" x 7.73" and 6.94" x 6.89"
5.92" x 5.88" and 4.89" x 4.86"
Create a stunning pillow with one of these flourishing designs! 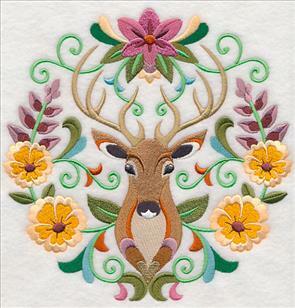 Natural elements make up the wreaths, while magnificent creatures take center stage inside. Find all of our pillow projects right here! 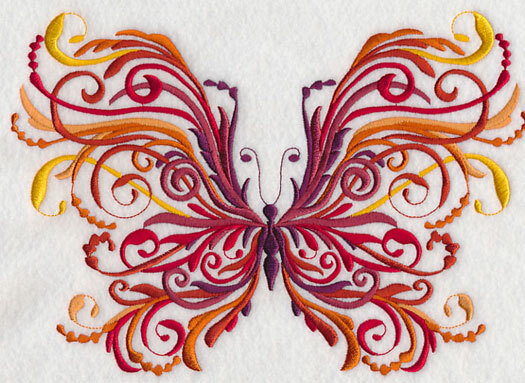 Add a butterfly and peacock to your next embroidery project! 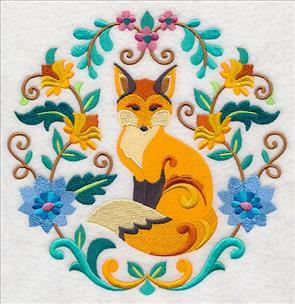 The gorgeous designs feature vibrant colors and intricate flourishes surrounding each animal. 7.78" x 7.65" and 7.01" x 6.89"
5.95" x 5.85" and 4.94" x 4.87"
7.80" x 7.73" and 6.95" x 6.90"
5.91" x 5.86" and 4.91" x 4.87"
Stitch an owl or a deer on a piece of framed art or on a wall hanging. 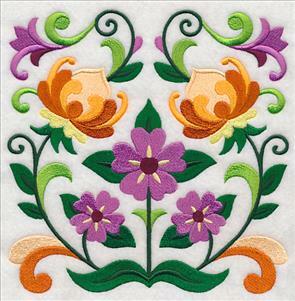 A great way to add color to your cabin, update kids' decor, or bring a natural look to a quilt. 7.69" x 7.79" and 6.90" x 6.99"
5.88" x 5.96" and 4.87" x 4.93"
7.77" x 7.79" and 6.89" x 6.91"
5.83" x 5.85" and 4.86" x 4.88"
Bright, vivid flowers burst out of blooming baskets in these colorful designs. 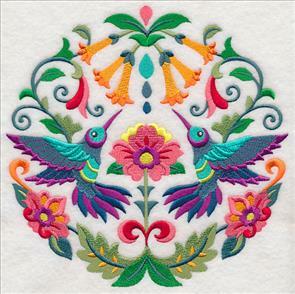 Stitch together on a pair of pillows or a couple of framed pieces. 7.71" x 7.80" and 6.89" x 6.96"
5.86" x 5.92" and 4.85" x 4.91"
7.79" x 7.78" and 6.89" x 6.89"
5.87" x 5.87" and 4.87" x 4.86"
Beautiful blooms come to life when you embroider these squares on aprons, placemats, and purses. Pick your favorite, or stitch them all! 7.81" x 7.78" and 6.88" x 6.85"
5.89" x 5.86" and 4.88" x 4.85"
7.72" x 7.80" and 6.88" x 6.95"
5.85" x 5.92" and 4.85" x 4.91"
Each of the blooming, symmetrical squares use a winning combination of colors, and are sure to brighten up any decor project. 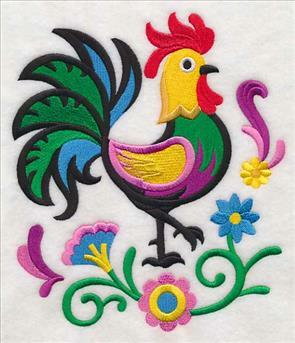 7.80" x 7.79" and 6.91" x 6.90"
7.80" x 7.70" and 6.90" x 6.81"
5.85" x 5.78" and 4.85" x 4.79"
Embroider these fabulous designs on pillows, totes, and more! Purchase them individually using the links above, or get them all in a design pack. Autumn is alive with the colors of red, gold, and burgundy. 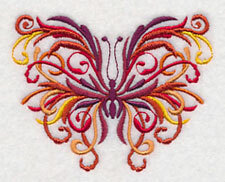 Stitch butterflies stitched in these same hues on your next embroidery project for a fashionable, flourishing look. 9.72" x 6.89" and 8.26" x 5.86" and 7.51" x 5.33" and 6.85" x 4.86"
Use the fiery butterfly designs to evoke the imagery of the fall landscape in your backyard, or to bring a fluttering look to your embroidery. This spray is especially striking on garden flags, cushions, and aprons. 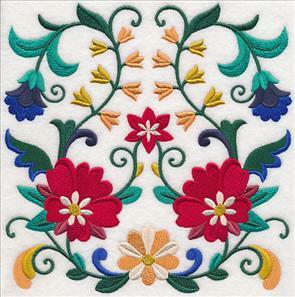 11.73" x 5.56" and 9.38" x 4.45" and 7.79" x 3.69" and 6.86" x 3.26"
Stitch the series of designs on bedding, a quilt, or a set of table linens. 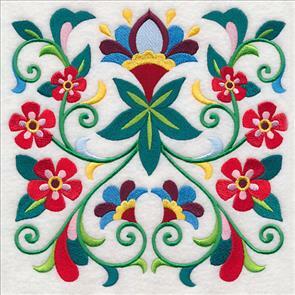 Repeat this border design down a table runner, or add to a towel for your kitchen. 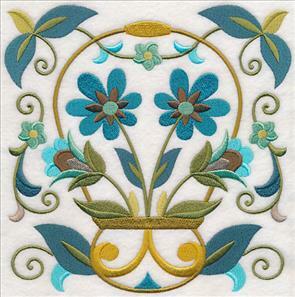 11.74" x 3.97" and 9.39" x 3.18" and 7.80" x 2.64" and 5.99" x 2.03"
A corner and single butterfly finish the group of fanciful designs. 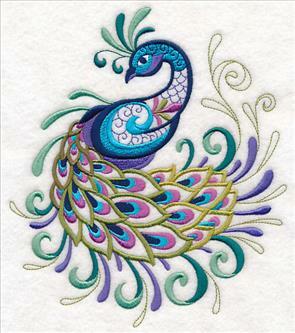 Whimsical and gorgeous additions to napkins, pockets, or framed artwork! 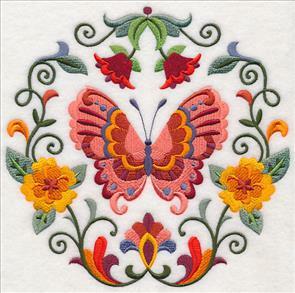 Bring the beauty of these butterflies to tote bags, placemats, or bed linens. Purchase them individually using the links above, or get them all in a design pack! 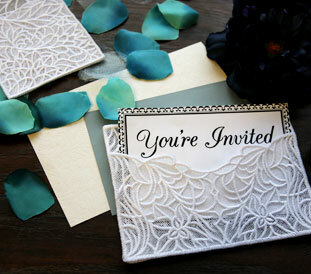 Send wedding cards, bridal shower invitations, or letters to your sweetie in a stunning freestanding lace envelope. Two different versions -- one horizontal and one vertical -- make it easy to customize to your event! 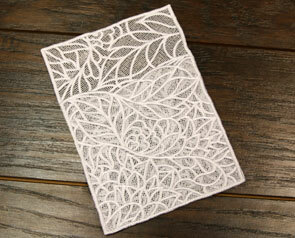 See how to embroider and assemble these lace envelopes here. 7.77" x 5.78" and 6.87" x 4.68"
Battenburg lace sprays featuring natural elements are a beautiful way to update your home decor! 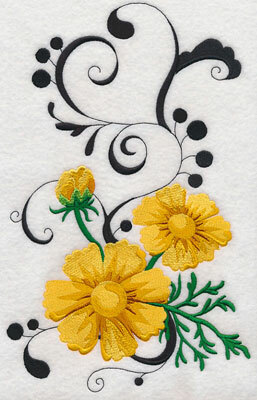 Add to apparel, slip in a card, or use to bring a brilliant look to table linens. Or, give a tea towel a whole new look with Battenburg lace added to the bottom! 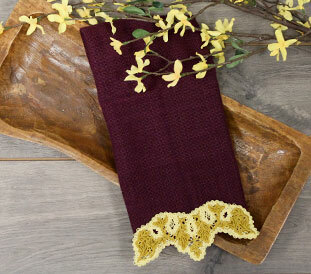 Simply stitch the stunning freestanding lace, then use a needle and thread to hand-stitch onto the towel. 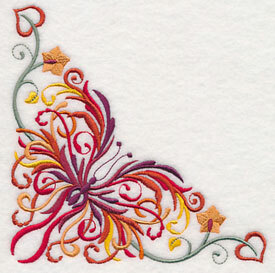 Find out more about embroidering Battenburg lace right here. 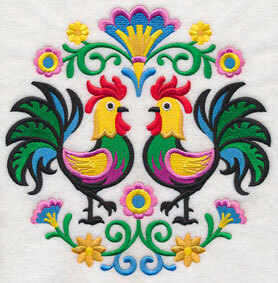 7.79" x 3.41" and 6.89" x 3.02"
7.82" x 3.88" and 6.87" x 3.40"
Jackie wrote in saying she'd love to see more Polish designs, especially Polish roosters. 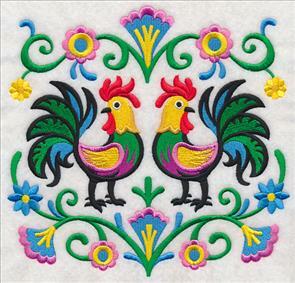 Here, three versions of the traditional folk art motif have been created -- a square, a circle, and a single rooster design. Thanks, Jackie! 7.80" x 7.39" and 7.28" x 6.90"
6.18" x 5.86" and 5.13" x 4.86"
7.74" x 7.80" and 6.84" x 6.90"
5.81" x 5.86" and 4.82" x 4.86"
6.73" x 7.80" and 5.86" x 6.79" and 4.86" x 5.63" and 3.33" x 3.86"